The William R. Jenkins Architecture and Art Library is pleased to present Cave Rewards by Mateo Tannatt. The exhibit will be on view for six weeks starting June 2. Tannatt is the 2017-18 Cynthia Woods Mitchell fellow in the UH School of Art. The exhibit will open with a reception held at the Architecture and Art Library on June 2 from 4-5:00pm, followed by a performance sound piece starting in the Architecture and Art Library and moving to the Organ Recital Hall in the Fine Arts Building. The reception and exhibit are open to the public. The University of Houston Libraries Special Collections preserves, safeguards, organizes, and describes materials in its collecting areas, making them available for use by the UH community and the general public. Anyone is welcome to visit the UH Special Collections Reading Room, located on the second floor of the MD Anderson Library. UH Special Collections is home to rare, unique, and irreplaceable items of intellectual, cultural, and societal distinction, and for this reason, the materials are stored separately from the main library in a climate-controlled setting. 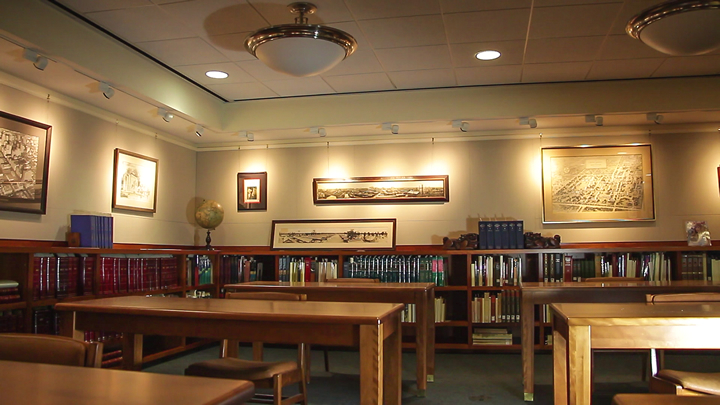 All are welcome to visit the UH Special Collections Reading Room. UH Special Collections boasts a remarkable variety of primary source materials, both historic and contemporary. It is here that visitors can experience the sound recordings, creative material, and personal papers of hip hop icon DJ Screw, read a letter penned in 1833 by Antonio López de Santa Anna, or study the campaign papers of the Honorable Annise Parker. It is where one French scholar traveled to immerse herself in the world of literary luminary Donald Barthelme. It is where the history of KUHT is preserved and made digitally accessible. It is home to over 106,000 rare and antique books, including The Handy-Volume Shakespeare from 1885 and a French devotional book from the Middle Ages. But there is much, much more in the archives of UH Special Collections. Students of all ages, scholars, researchers, history buffs, and lifelong learners, the curious and creative, can avail themselves of a vast array of singular treasures preserved here. While UH Special Collections is known for its rich, Houston-centric collecting scope, the research collections also comprise primary materials with state, national, and global significance. View a full list of collecting areas and archivist contact information. A source of pride for UH Special Collections stems from its strong relationships with individual and organizational partners. UH faculty collaborate with archivists to connect students with primary source materials for transformational learning experiences. Archivists work with campus and institutional colleagues to increase the visibility of, and access to, the collections in the community through exhibits and sharing of materials. Visitors are encouraged to start by checking the collection coverage at the UH Special Collections website. Type a search term in the Archival Finding Aids field, or browse by collecting area. A finding aid is an inventory of a collection that contains an overview of the collection, scope and contents, and a biographical note. You’ll find that some collections have varying levels of description; some are more detailed than others. It’s helpful to look at the finding aid as a map that will lead you to relevant material. For those who aren’t sure of the materials they need, it is best to contact a friendly and knowledgeable Special Collections archivist or staff member. Archivists oversee the collections and know what they contain and what they don’t. These professionals can direct you toward areas of the archives that may have been overlooked, or can suggest secondary general resources. Archivists can also assist students and researchers in articulating research questions. These are often developed or modified after an examination of the materials reveals new and interesting avenues of inquiry. Once you have browsed the website and located specific materials that fit your research scope, schedule a visit to the Reading Room with a request to have the material pulled and ready for you when you arrive. An ID is needed to use the collections. On your first visit, you will be asked to complete a Patron Registration Form. A staff member will give you a quick orientation on how to handle the material. You may also use the computer in the Reading Room to browse finding aids. You’ll be given one box at a time. While looking through the materials, take full citations for later reference. Smartphone cameras are welcome in the Reading Room for the purposes of private study and research only. Find out more about visiting UH Special Collections. The UH Digital Library makes digital collections available online, documenting the University, city of Houston, and state of Texas, as well as other historically and culturally significant materials. Collections within the UH Digital Library are mainly derived from Special Collections as well as the William R. Jenkins Architecture & Art Library and the Music Library. A few collections are from the UH Hilton College Hospitality Industry Archives. The main UH Libraries’ OneSearch allows you to search through journals, databases, the catalog, research guides, and the website. Have a question not covered above? Contact us. 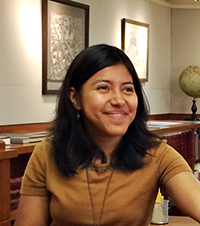 University of Houston Libraries welcomes Veronica Douglas as the new instruction coordinator. Please describe your role at UH Libraries and talk about some of your professional goals. As the UH Libraries’ instruction coordinator I oversee the library’s information literacy initiatives in lower-level undergraduate courses such as English Composition. I’ll also be responsible for assisting liaison librarians incorporate information literacy into their respective subject areas, offering professional development to my colleagues in the areas of teaching and assessment, and developing a vision and plan for the library’s teaching program. My goals include empowering librarian colleagues to embrace their identity as teachers and recognize their expertise as educators; debunking the idea that information literacy is just about library instruction or research skills instruction; and working with faculty at the University of Houston to design courses and assignments that take a critical approach to incorporating information literacy. Please share a bit about your background and interests. How do these inspire and shape your approach as a librarian? I’ve been a liaison librarian and teacher throughout my 11 year career in libraries. Over the past 6 years, I’ve become a strong proponent of critical information literacy, which focuses on the sociocultural, political, and economic forces that influence the ways in which information is created, valued, shared, and accessed. I try to teach information literacy as more than just library or research skills, and encourage students to consider how information shapes the world in which they live. I am also very interested in feminist pedagogy and how it can be used to empower students in the information literacy classroom by valuing their unique perspectives and experiences. My research interests center around the application of relational cultural theory to librarianship, which I see as a way of bringing the work of relationship-building we do as librarians to the forefront of our professional values. Please describe your first impressions of the University of Houston. I’m actually returning to the University of Houston! My first job out of library school was as the psychology and social work librarian at the UH Libraries. I moved away in 2009 because my family relocated, and I am so glad to be back at UH. I’m impressed by the growth and advancement of the university—there are so many new buildings, excellent student success initiatives, and advances in research projects. The diversity of the campus community was something I always loved about UH and I am happy to see that the spirit of inclusion continues on this dynamic campus. Over the past year I’ve developed a pretty regular yoga practice and have really appreciated the physical and mental benefits that accompany this activity. I’m still very much a novice, but I find that yoga practice helps me feel more at peace with my limitations and prouder of my accomplishments and strengths. It’s a great way to quiet my mind, which is always going a mile a minute, and I can definitely feel myself getting stronger, which is a bonus. I’ve even managed to get my 6 year old son interested in yoga, although he is far more flexible than I am! University of Houston Libraries Special Collections and Public Art of the University of Houston System announce the Andy Warhol Photographs collection, now available to the public for the first time and offering a rare and fascinating view of the artist’s working process. 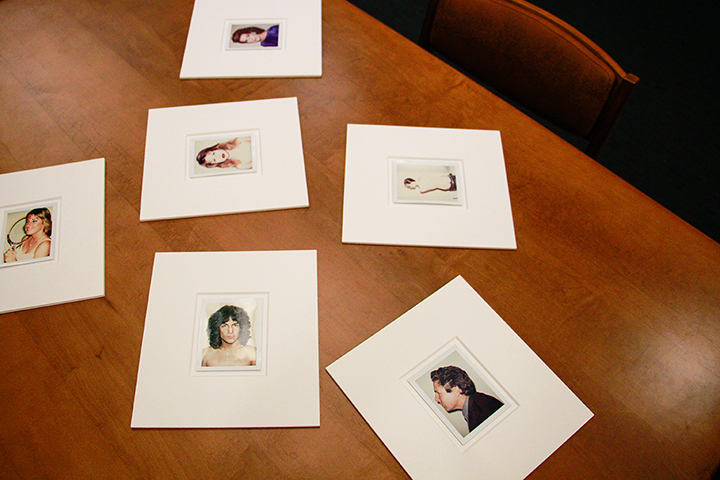 Andy Warhol Photographs are now available to the public in the UH Special Collections Reading Room. The collection comprises 149 photographs, 99 Polaroids and 50 black-and-white silver gelatin prints, created by Warhol from 1975 to 1985 and including his friends, celebrities, and socialites. Among the iconic faces captured by the pop artist are Julian Schnabel, Princess Caroline of Monaco, Jamie Lee Curtis, and Billy Squier. The collection was gifted to Public Art of the University of Houston System by the Andy Warhol Foundation for the Visual Arts and was made possible through the Photographic Legacy program which launched in 2007 to provide greater access to Warhol’s unknown bodies of work. The program donated more than 28,500 photos by Warhol to 180 educational institutions, including UH, which received a curated selection of the artist’s original photos and prints. A 2008 exhibition at Blaffer Gallery celebrated the acquisition and displayed over 50 of the images. Michael Guidry, curator of Public Art of the University of Houston System, partnered with Mary Manning, UH Special Collections’ Performing and Visual Arts Research Collection curator, to make this extensive selection of Warhol photos accessible to researchers, scholars, and the general public. Visitors may view the collection in the Special Collections Reading Room. Special recognition goes to the staff who helped make the collection available, including Bethany Scott, digital projects coordinator, and student assistant Micaela Cadungog. Patrons gathered at the home of Annise Parker and Kathy Hubbard for the LGBT Research Collection Salon last week. Guests were given the rare opportunity to view a selection of the preserved and historically rich treasures in the collection and to celebrate its continued growth. Parker and Hubbard are members of the Libraries Dean’s Campaign Committee and Cabinet supporting the LGBT Research Collection. In her welcome to salon guests, Parker stated that she and Hubbard are committed to the preservation of the history of the LGBT community. Dean of Libraries Lisa German thanked Parker and Hubbard for their generous support, spoke about the Libraries and its mission, and introduced colleagues in attendance, including head of Special Collections Christian Kelleher and curator of the LGBT Collection Vince Lee. The LGBT Research Collection exists to collect, preserve, and make widely accessible original documents, publications, photographs, artworks, film and videos, and artifacts by and about the LGBT community. The scope of the material is largely representative of Houston, with a national and international reach. The collection grew out of UH Special Collections’ involvement with the Houston Area Rainbow Collective History (ARCH) and the leadership of community organizations and individuals. These include the Botts Collection, Gulf Coast Archive and Museum (GCAM), the Banners Project, JD Doyle, the Transgender Foundation of America, and Rice University, among many others. Materials document the communities’ activist, cultural, social, and political activities, and the personal experiences of community members. In addition to preserving the history of the community, the collection supports scholarship and teaching by serving as a tool for discovery, original research, and the development of critical thinking skills. Materials are not only available to UH students and researchers, but to the general public as well. Anyone can visit the Special Collections Reading Room to view the materials in person. Watch video (courtesy of Sara Fernandez) of speakers at the LGBT Research Collection Salon. 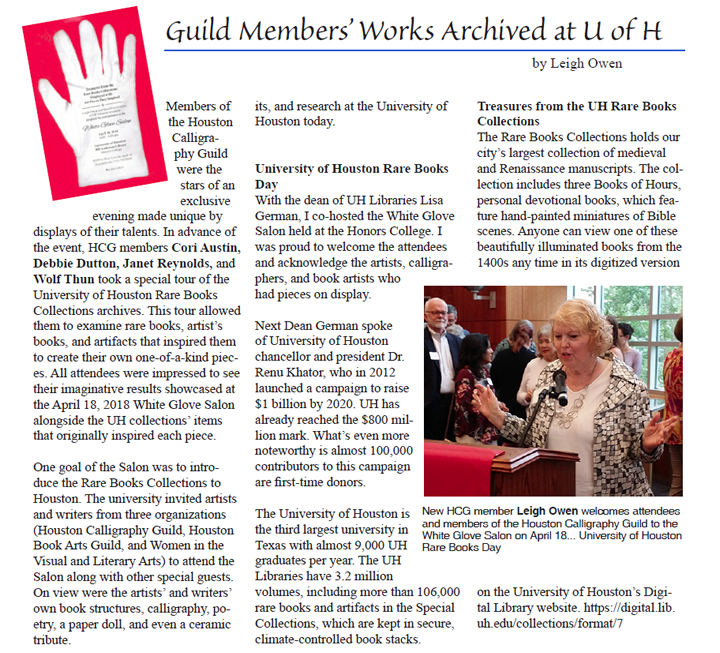 The recent White Glove Salon was featured in the May-June 2018 Houston Calligraphy Guild newsletter, Handscrit (pages 16-18), written by Leigh Owen, who is a member of the Libraries Dean’s Campaign Committee and Cabinet supporting the Rare Books Collections. 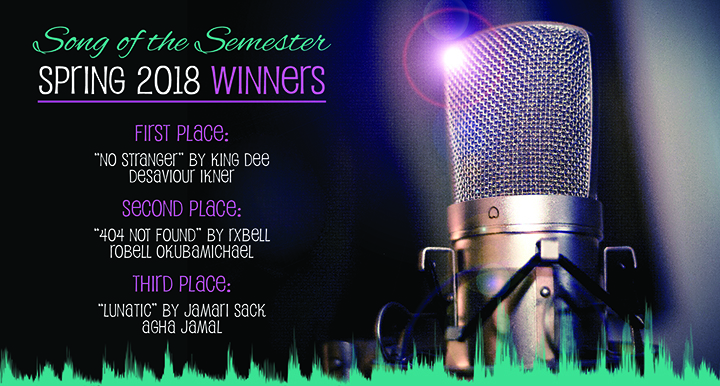 University of Houston Libraries is pleased to announce the winners of the first-ever Song of the Semester student song contest. Robell Okubamichael won second place with “404 Not Found” (artist name Rxbell). Agha Jamal took third place with “Lunatic” (artist name Jamari Sack). Congratulations to the winners and to all those who entered. The next contest will be held in the fall 2018 semester. All entries were recorded in the Hamill Foundation Multimedia Studio at the MD Anderson Library. Lisa Cruces, Hispanic Collections archivist at the University of Houston Libraries, has been accepted to the competitive Association of Research Libraries (ARL) Leadership and Career Development Program (LCDP). 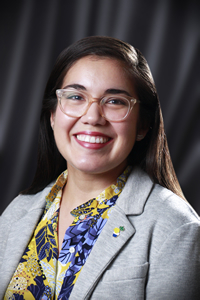 Cruces is one of 25 fellows chosen for the 2018-2019 cohort. The LCDP is a yearlong program to prepare mid-career librarians from historically underrepresented racial and ethnic groups to take on leadership roles in their careers and in the profession at large. The program addresses the need for research libraries and archives to develop a more diverse professional workforce that can contribute to library success in serving the research, teaching, and learning of increasingly diverse scholarly and learning communities. This is accomplished, in part, by providing LCDP fellows with meaningful exposure to the major strategic issues that are shaping the future of research libraries. As Hispanic Collections archivist, Cruces preserves and facilitates access to collections documenting the history of Hispanics in Houston and greater Texas. She engages in outreach, instruction, collection development, and research grounded in promoting Hispanic history. Prior to joining UH, Cruces was the 2012-2014 Librarian-in-Residence at the University Of Notre Dame’s Hesburgh Libraries. Cruces holds an MS in Information Studies with a specialization in Archives from the University of Texas at Austin.